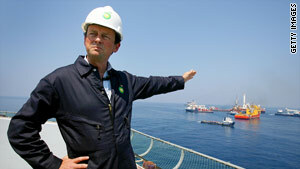 BP CEO Tony Hayward takes a look at the recovery operations 55 miles south of Venice, Louisiana. Letter from committee's head notes "serious questions"
Lawmakers accuse company of "carelessness and complacency"
Washington (CNN) -- BP chief Tony Hayward should be prepared to face tough questioning about the cause of the Gulf oil disaster when he appears before a key House committee on Thursday, according to a letter released Monday by the committee's chairman. The letter to Hayward from House Energy and Commerce Committee Chairman Henry Waxman, D-California, says a congressional investigation alleges that the besieged oil company took a low-cost, speedy approach to drilling the broken deepwater well responsible for the growing spill in the Gulf of Mexico. Our "investigation is raising serious questions about the decisions made by BP in the days and hours before the explosion" that created the spill, Waxman noted. "On April 15, five days before the explosion, BP's drilling engineer called (the facility in the Gulf) a 'nightmare well.' "
The letter -- co-signed by Oversight and Investigations Subcommittee Chairman Bart Stupak, D-Michigan -- asserts that BP saved $10 million in part by skimping on a process to properly cement the well. It also asserts that BP ignored advice from Halliburton, its cementing subcontractor. "BP appears to have made multiple decisions for economic reasons that increased the danger of a catastrophic well failure," the congressmen said. "In several instances, these decisions appear to violate industry guidelines and were made despite warnings from BP's own personnel and its contractors. In effect, it appears that BP repeatedly chose risky procedures in order to reduce costs and save time and made minimal efforts to contain the added risk." BP failed to run a multiple-hour a "cement bond" procedure -- meant to assess the integrity of the well's cement seal -- despite a mid-April review that predicted cement failure, according to the letter. An independent expert told congressional investigators that this was a "horribly negligent" decision, the letter notes. BP also decided to forgo the safety step of fully circulating drilling mud in the well before cementing, the letter claims. "Time after time, it appears that BP made decisions that increased the risk of a blowout to save the company time or expense. If this is what happened, BP's carelessness and complacency have inflicted a heavy toll on the Gulf, its inhabitants and the workers on the rig," Waxman and Stupak contend.